The flavors of Vietnamese cooking are ones we could eat every day, all year round. Here, James Beard Award–winning cookbook author Andrea Nguyen explains how to bring the tenets of this bright, brilliant cuisine home. When my family fled the communist takeover of Vietnam and settled in Southern California, supermarkets carried a limited array of Asian ingredients. It was 1975, and there was no fish sauce, a staple that we missed dearly. My mother figured out American work-arounds, and when needed, she stocked her pantry via a trip to Los Angeles’ Chinatown. She taught me to honor tradition yet also be resourceful and creative. Vietnamese food fuses the country’s tumultuous history with its regional differences and interactions with foreign nations. Zippy sauces, fresh herbs, springy noodles, and East-West overlaps delight on many levels. Nowadays, you don’t have to shop at an Asian market to make good Viet food—most major supermarkets carry the basics in their international aisles. There’s never been a better time to make Vietnamese food part of your routine. Stir-frying happens fast, so line up prepped ingredients to gracefully and easily glide through the cooking process. You don’t have to use a giant wok; any wide pot or pan that can take a lot of heat will collapse all the greens into a crisp-tender, savory side dish. 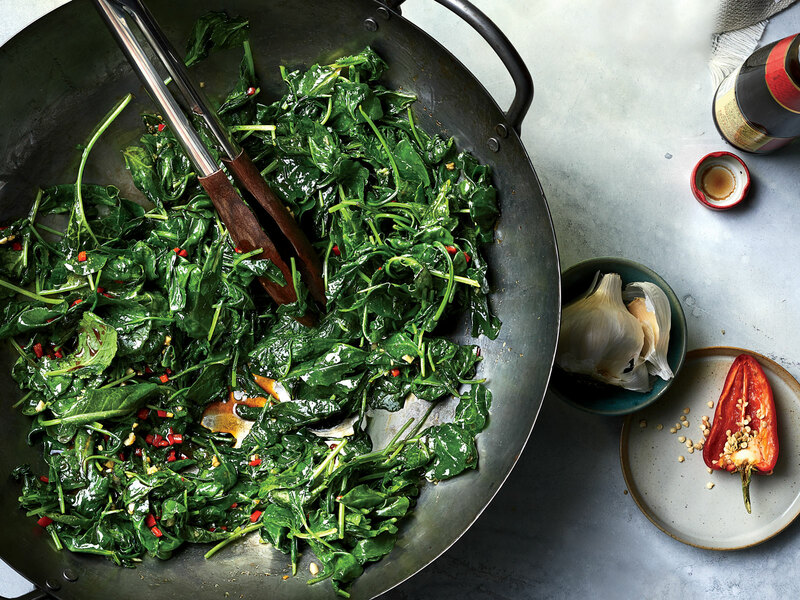 This recipe is my supermarket take on the classic, subbing baby kale for water spinach, a go-to vegetable in everyday Viet meals. Added bonus: Prewashed greens don’t release much liquid, which can dilute flavors and turn a stir-fry sizzle into a fizzle. To make VIetnamese rice noodle salad bowls, simply layer the ingredients in a bowl, and let diners dress their own at the table. The vegetables provide refreshing crunch; the noodles carry flavor; and a bold homemade sauce, nuoc cham, unites things with its Viet imprint. The main feature and toppings are up to you; in this version, grilled chicken skewers are the highlight. 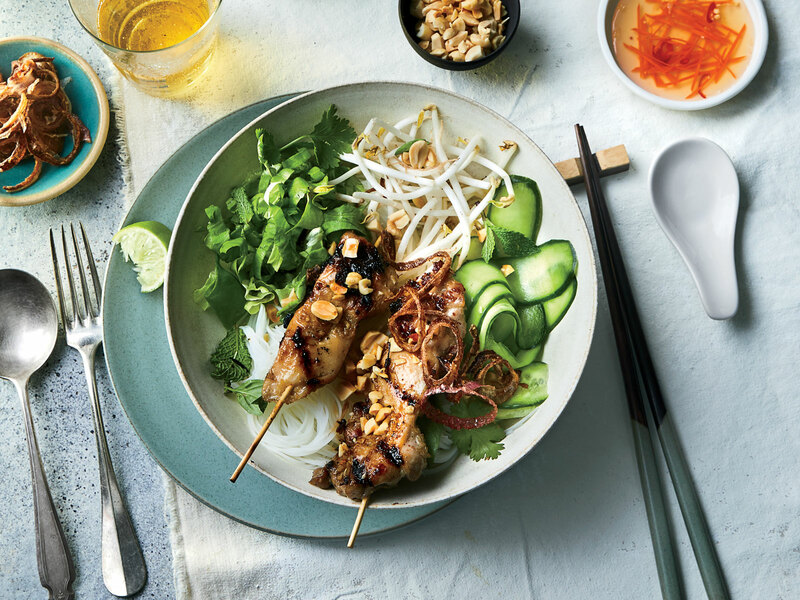 Vietnamese food overlaps and blends many cultures, so there’s flexibility when setting the table. Before a Viet meal, inventory the menu to determine what’s required. For traditional Vietnamese menus (a soup, vegetable, main dish, and rice), set out a salad-size plate and a rice bowl for each person; if needed, include a small dipping-sauce dish, too. If there’s no soup that day, or if bulky foods or entrées that require wrapping are involved, use dinner plates. Also, when placed under big bowls of noodle soup, dinner plates can serve as handsome chargers and are useful for holding spent herb sprigs, lime wedges, and the like. (Or, set out a communal plate for refuse.) Along with China, Japan, and Korea, Vietnam is a chopstick-wielding country. Place a pair, along with a Chinese or Western soup spoon, on the right side of each plate. Add a knife and fork if the menu requires them, or if you or your fellow diners are not comfortable using chopsticks. If it’s a DIY, hands-on meal, keep paper towels handy. Viet rice paper rolls are not exclusive to spring or summer. Enjoy them year-round: They’re simply a salad encased in translucent rice paper. You can make the hand rolls for diners, or show your guests how to do it themselves for a fun meal. Here are a few guidelines to keep in mind. 1. 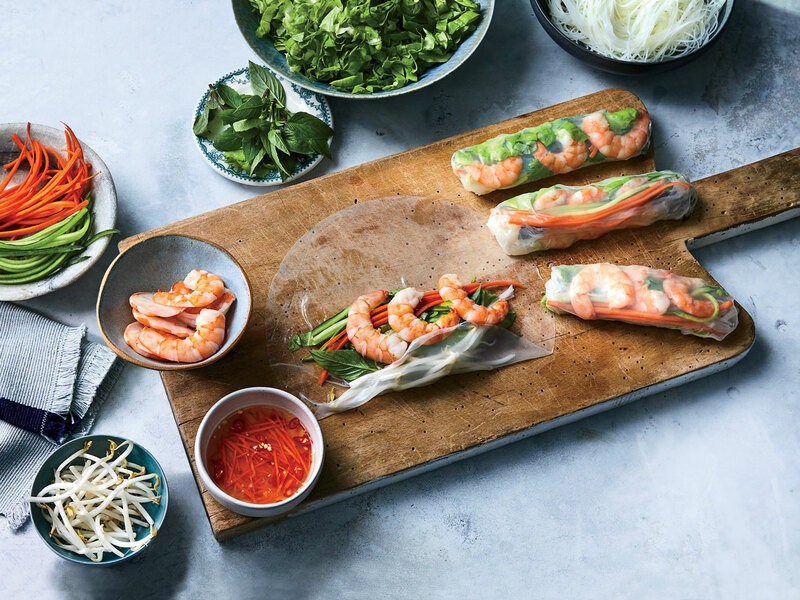 Layer fillings in the lower third of the damp rice paper sheet: lettuce first, then noodles, herbs, carrots, and shrimp. 2. Bring up the bottom edge of the rice paper to cover the filling. Then roll away from you once; the lettuce now faces you and the rice paper edge is tucked under. 4. Finish rolling upward to create a burrito-like package. The rice paper is self-sealing. Now your rolls are ready to eat or store. Meat is precious and Buddhist traditions are strong in Vietnam, which is why dishes of beef are considered a luxury. Clever cooks cut tender, marbled cuts into small pieces so they soak up flavor, then cook them quickly and serve them hot with aromatic herbs. 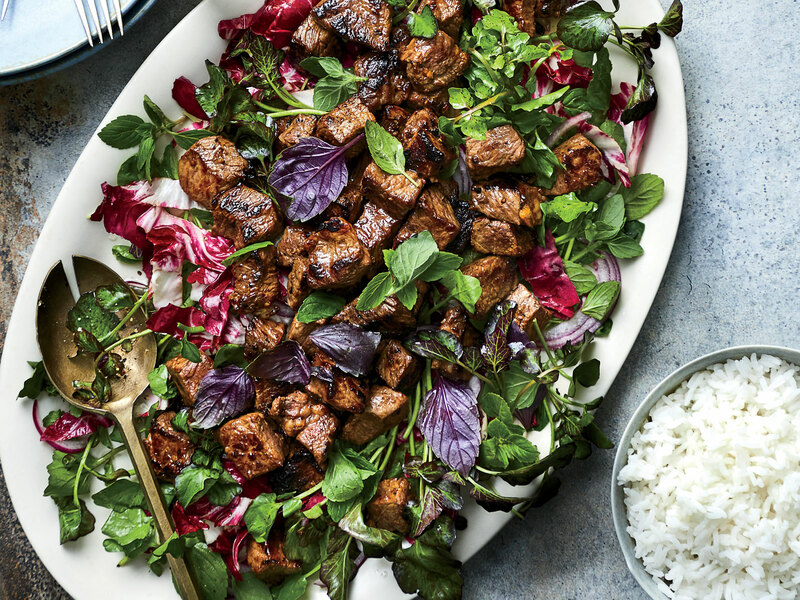 Here, the peppery, salty-sweet, juicy beef mingles with the light salad dressing to create a great sauce that pools on the platter, perfect for drizzling over rice. Watercress leaves warm and wilt under the Shaking Beef (so named for the back-and-forth shaking of the pan), while their stems remain crunchy. In the summer, sub cherry tomatoes for the radicchio. For a stunning appetizer, serve the sautéed beef with some fresh herbs and toothpicks for easy sharing. For everyday meals, Vietnamese cooks make stew with many kinds of proteins. The dishes are generically called kho (“caw”), and traditional ones are simmered with bittersweet caramel sauce and fish sauce. 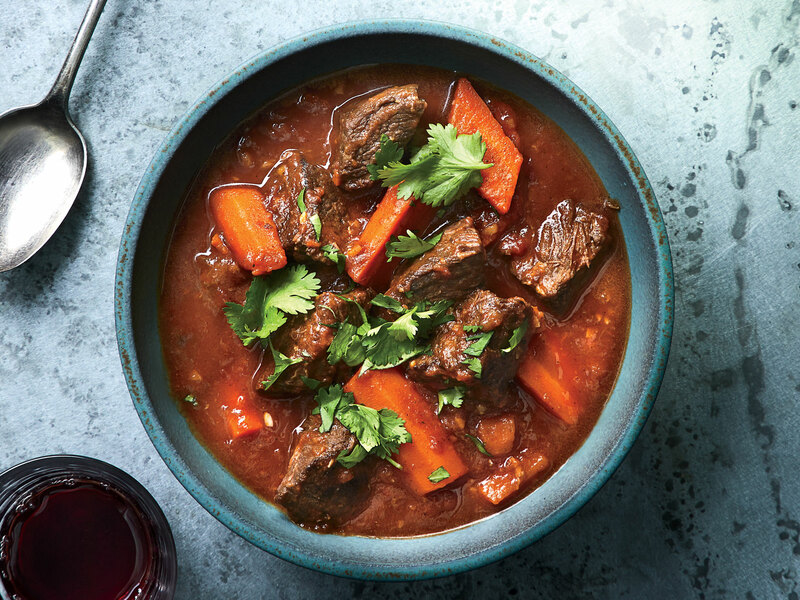 Then there’s this southern Viet–Franco favorite called bo kho (“baw caw”), which features beef, star anise, and lemongrass in a tomatoey sauce. With a wet marinade, the beef doesn’t get deeply browned during the initial sear, but that’s OK—cooking down the aromatics and tomato builds layers of savory depth. If you need extra oomph right before serving, add a glug of fish sauce, the Viet secret ingredient. 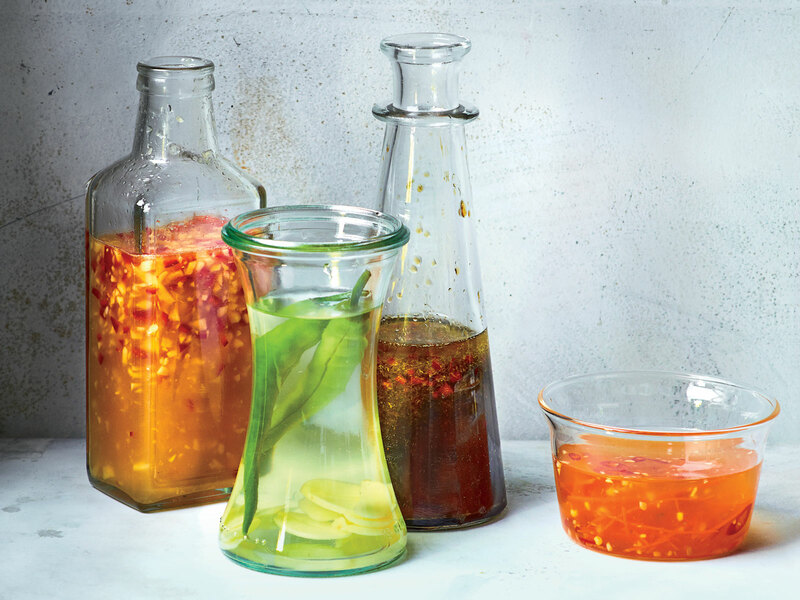 Keep these versatile sauces in your back pocket. Deploy them for the traditional dishes on these pages, or use them to add a Viet imprint to anything from breakfast scrambles to salads and slaws.